After seeing this favorable review in the Historical Novels Review, I had to read After Anatevka. 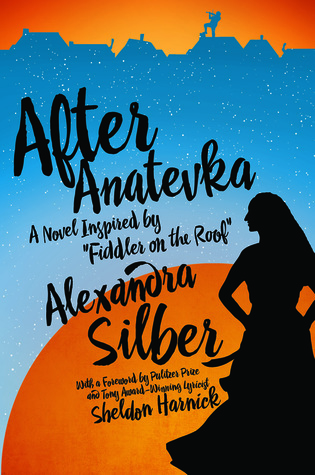 A Novel Inspired by Fiddler on the Roof by Alexandra Silber. I’ve seen the musical, of course, on stage and the movie version. Of the three daughters’ love stories, the romance between the middle daughter, Hodel, and her scholar/revolutionary suitor, Perchik, captivated me most. So I was intrigued by the idea of a novel that filled out the back stories of these two and followed them into exile in Siberia. Hodel tries to find Perchik, but is imprisoned for over a year, kept away from him by those who hope she can shed light on his work. A political prisoner, Perchik has been sentenced to labor in the salt mines in Nerchinsk. Hodel is aware of his socialist ideals but knows no particulars. She can name no names. Her ignorance frustrates her captors, but likely it is that ignorance/innocence that saves her from a worse fate. Eventually, she is allowed to join Perchik as one of the "voluntary wives," women who have chosen to share their husbands’ exiles. As you would imagine, life is brutally hard in Siberia. The story intersperses scenes from their struggles in Nerchinsk with vignettes from their pasts. Particularly sweet and thought-provoking are Hodel’s memories. They are imbued with tradition and familial love, linking this novel beautifully with the enduring message of the play. The author also weaves a back story for Perchik, the brilliant revolutionary who grew from an unloved, unwanted orphan, to a disillusioned wastrel of a scholar, to an impassioned leader, and above all, a man deeply, passionately, devotedly in love with Hodel. While his story is convincing and interesting, it was less emotionally moving than Hodel’s. After Anatevka is a heart-wrenching re-imagining of Fiddler on the Roof. This is the early 1900s in Russia and these are Jews and Revolutionaries. Impending doom hangs over the lovers; yet the novel is not oppressive. Perchik is an idealist who truly believes a better world is coming. Hodel has a deep religious faith. And the love they feel for one another not only allows them to endure hardship, it inspires others to endure. I took advantage of a short plane ride to read a novella I’ve been anxious to get to: The Butterfly Farmer by Lynn Hoffman. I’m a fan of his contemporary relationship-based novels which are peopled by relatable characters in poignant situations. (He has also written a memoir, Radiation Days, which is highly recommended.) Hoffman is a poet and a culinary expert who has published nonfiction books on beer, wine, and rum. So naturally, the writing is beautiful and the novels are rich with descriptions of food and drink. Although far from being a foodie myself, I can appreciate the sensual details of cooking and eating, and I love how integral food and drink are to the progress of the romance. 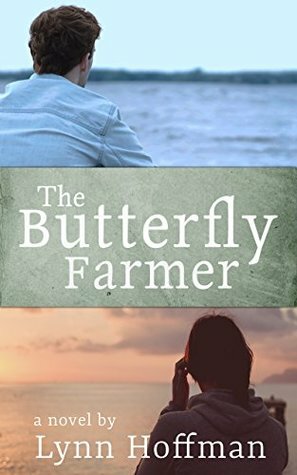 In The Butterfly Farmer, Jonathan Motaro has recently lost his wife to cancer. Taking stock of his life, he realizes that he was much more dedicated to his marriage than she was, and he’s not quite sure what to do with the loss of it. His wife had been a passionate gardener. He continues puttering out of habit until, inspired by the presence of a butterfly, he is awakened by a desire to create a butterfly-friendly garden on his island home. Simultaneously, divorcee Julia Clewitt, newly turned forty, buys herself a sailboat. The divorce, eleven years earlier, has left her commitment shy. The sailboat is her refuge. Jonathan is a good cook and food-lover; Julia is a chef turned teacher of chefs. One day while sailing, Julia notices the swath of green that is Jonathan’s butterfly garden. The two meet. A relationship begins. The story is sweet, gentle, and touching. There are difficulties, anticipated and unanticipated with a twist that surprises. The compelling characters, the wonderfully rendered island atmosphere, and the food you can almost taste make this a book you’ll want to read in one sitting. A while ago, I reviewed Philippa Jane Keyworth’s Regency Romance The Unexpected Earl for the Historical Novels Review. It was sweet and fun, so when I saw that her current novel, Fool Me Twice, was a kindle freebie I grabbed it. Given the world she lives in, Caro has no choice but to make her way to London for a Season and find a rich husband. She is accompanied by a single maid and manservant who follow her devotedly and depend upon her for their livelihood. In order to set up a household and appear "independent," it is necessary for Caro to have money. So she invents an alter-ego, an illegitimate half-sister, Angelica, who frequents the gaming hells to acquire cash. The hero of the story is the wastrel second son of a straight-laced viscount, Honorable Tobias Fenton. Unable to please his father, Fenton has taken the tack of exasperating him instead. Nevertheless, his heart is good and he is cleverer than he seems. He is the first to put two and two together and realize that the demure, respectable Caro Worth and the flirtatious, scandalous Angelica Worth are one and the same. Beautiful and vivacious, Angelica attracts the wrong man and compounds the error by winning a great sum of money from him. He determines to have her for his mistress and Caro is caught in the web of her own deceit. Fortunately, Caro has friends, among them Fenton, who is smitten. When she realizes she can rely on friends and doesn’t have to go it alone, her prospects change. The plot is a bit far-fetched and Caro, when desperate, is inclined to take bad situations and make them worse. Plus, a petty irritant is how often people are described as "saucy" throughout the book, especially at the beginning. However, the story is light-hearted and fast-paced and the banter between Angelica/Caro and Fenton was entertaining enough to keep me reading until I was drawn in by the charming character Fenton grew to be. 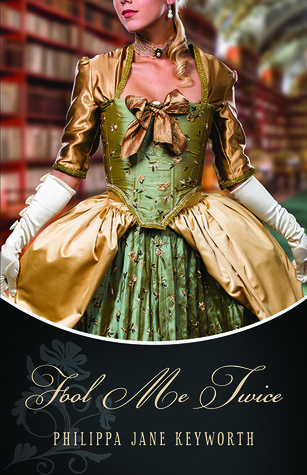 Fans of clean historical romance with a hint of danger should enjoy Philippa Jane Keyworth’s books. A few years ago, our local theater staged a production of Shakespeare’s The Tempest. I usually love when they do Shakespeare, but I wasn’t crazy about this one. Too much otherworldliness and spectacle. Nevertheless, I enjoy re-imaginings of Shakespeare’s plays and I was curious to see how the author, Jack Todd, would tackle The Tempest with Rose and Poe. Rose is a warm, generous woman. Orphaned as a child, she’s brought up by a witch of a grandmother. Rose gets pregnant. The father feels he is too good for her and she thinks so too, so she determines to raise her baby by herself. Despite the unfairness of her world, Rose never holds grudges (except against her grandmother) and she comes to be loved by the community of her small, isolated New England town. Her son, Poe, is different, but Rose refuses to let that be a problem. Huge, six-fingered and six-toed, monstrously strong but gentle as a lamb, Poe is "simple." In spite of everything, he and Rose carve out a life for themselves raising goats and selling cheese. Their neighbors, Prosper Thorne and his daughter Miranda, are good to them. Prosper has given Poe purpose by assigning him the task of building a stone wall. Miranda, who is young, athletic, and beautiful, has been a friend of Poe’s throughout their lives. However, Miranda has gone off to Boston to college, returning home for vacations and to check on her father. Prosper is in the early stages of dementia. Throughout her life, Rose has faced daunting challenges in her quest to mother Poe. Despite her circumstances, she succeeds. But the true test comes when Poe emerges from the woods one day carrying the beaten, bloodied, near-dead Miranda. He stumbles across the path of the local sheriff and is unable to say more than "get help." Poe is immediately arrested. The town turns against Poe and as Rose fights to protect him they turn on her, too. Rose is a character to adore: uncomplicated, feisty, loyal, and loving. Grateful for the blessings that come her way, seeing things as blessings that others might grumble over, she decides on a goal and single-mindedly pursues it until she accomplishes it. The story put me in mind of The Minotaur Takes a Cigarette Break by Steven Sherrill, another book in which an oddball outcast finds himself falsely accused of assaulting a female friend. The characters are quite different but the themes are similar. You don’t have to be familiar with The Tempest to enjoy this novel (released this month). And if you are, you don’t have to have liked it very much to like Rose and Poe. 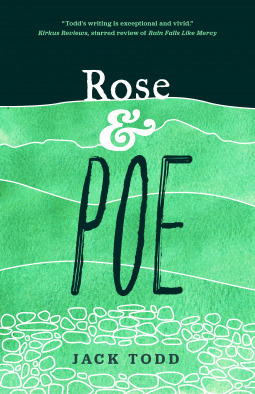 And those who love The Tempest are sure to find Rose and Poe an impressive re-imagining. I received this book free from the publisher in exchange for an honest review. And then, I lost the book! I turned my house upside down looking in all the places I usually stash books, and couldn’t find it anywhere. It was one I really wanted to read, so I bought it. I’m glad I did. Dark Lady. A Novel of Emilia Bassano Lanyer by Charlene Ball is the story of a woman at the very fringes of Queen Elizabeth’s court who became the first, or one of the first, professional female poets in England. Emilia’s position was always precarious. The daughter of a court musician, she was an exceptionally skilled musician herself. Her father died when she was seven, and her mother made the difficult choice to send her to be fostered at the home of a countess who had very liberal views on female education. Emilia learned Latin as well as court skills. A beautiful girl, she attracted attention but generally of the unwanted kind, since her rank was too low to interest any young lords in marriage. The early part of the book glides quickly over her early years setting up what is to come. Eventually, Emilia’s patron remarries and she is cast back upon her family: her mother, dying of consumption, and a host of cousins, particularly the concerned, motherly Lucrezia, who explains to Emilia that she comes from a family of converted Jews, some more converted than others. Emilia has another supporter as well. The generous-hearted (and significantly older) Lord Hunsdon, Henry Carey, the cousin of the queen, has known her since she was a child. He watched her grow up, continued to treat her kindly after she is essentially abandoned by her other court friends, and sends aid and a well-respected physician to her home to treat her mother. Emilia’s fondness for him grows and she agrees to become his mistress, after seeking counsel from Lucrezia. With his backing, she returns to court where she is accepted by many and shunned by others. The female intelligentsia of the court are particularly welcoming. As time passes, Hunsdon, who is one of the queen’s top military leaders, must spend significant time away from London. Plus, he is aging. Emilia enjoys a great degree of independence because her status as his mistress is known. She meets William Shakespeare and is attracted to his intelligence, charm, and good looks. His flirtation excites her adventurous spirit. She becomes Shakespeare’s lover as well. Emilia is a strong-willed, passionate woman, who fights for her right to be taken seriously despite her gender. She makes some bad decisions, but has a forgiving nature and generally manages to smooth troubled waters with graciousness. Emilia is a bold, fascinating character and this novel does a lovely job imagining her story.